Manage your home Wi-Fi network securely with the Apple AirPort Express 600 Mbps 2-Port wireless router. This white base station allows you to use a single device to integrate the ISP connection of your house into a LAN for your wireless devices. With these routers, you can connect laptops, smartphones, and tablets to the Internet or a home network from any room in the house. Apple, Windows, and Android devices are all supported. The USB ports on the back of the Apple AirPort Express allow you to connect to wireless devices like printers and shared hard drives.Featuring maximum data transfer rates of up to 150 Mb/s, this wireless AirPort Express router comes with Ethernet connection and Wi-Fi protected setup for enhanced network security. Keep unauthorized users out of the network and allow authorized users in quickly with WPA password protection. You are able to create a guest account for temporary visitors with a separate password and unique restrictions. This includes the amount of time or the hours of the day when they can be connected. AirPort software allows you to create limited-time guest passwords with an expiration date. The built-in firewall helps to ensure your network's safety.Featuring simultaneous dual-band connectivity, the Apple AirPort router allows Wi-Fi electronics to connect either to a 2.4 GHz or a 5 GHz wireless band. Connected electronics are able to connect exclusively to the band that the device supports or choose between a high-demand and low-demand frequency. This helps to provide peak quality performance. As an added bonus, this base station features AirPlay, which beams the music from your iTunes library by way of your iOS device. It will send the music wirelessly to a stereo or speaker system in the house that is connected via a compatible audio cable. This allows you to play your music on any set of wireless network speakers.For added convenience, you can manage the AirPort Express Router from any of your mobile phones or compatible electronics with the downloadable app. This feature allows you to restart the unit, track the IP address and usage rates of different units, and enable or disable certain features. You can extend the local range of Wi-Fi coverage when you use several Apple AirPort Express base stations as a series of signal amplifiers. Installation of the 2nd Generation Apple AirPort Express is fast and simple. It only requires a few steps and can be done in less than 5 minutes. 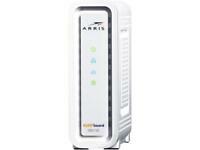 Simply attach the Ethernet cord and connect the unit to your Internet Service Provider's modem. From there, power the unit on, and with a few taps on the screen of your iPhone, iPad, or iPod, create your network settings and passwords. If using a Mac computer and a Lion operating system or newer, you can use the AirPort utility to configure the settings for your home network.With diminutive dimensions of 3.9 by 3.9 by 0.9 inches, this white base station will easily fit anywhere in the house and blend in with most styles of decor. Weighing only 8 ounces, the router is easy to handle when installing or changing rooms. Shipped as advertised. NIB. Great seller! Thanks! 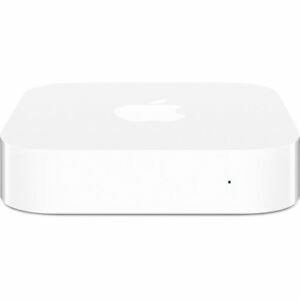 Apple AirPort Express Base Station Wireless Router is a good and inexpensive way to expand your network's reach within your home, especially if you already are using an AirPort Extreme (abbrev. Extreme) primary LAN (local area network) router. First, locate the AirPort Express (Express) physically where you think it will do the most good--e.g., the other end of the house yet within signal range of your primary router. Any wireless router should be place high up near the ceiling of the room in which it is located in order to obtain the greatest signal range. Next, plug in the Express and return to your Mac computer, where you will find and open the AirPort Utility app. The app will almost immediately find the Express and ask whether you want to add it as a bridge router to your present network. Answer 'yes' and the connection is made. The Express will repeat synchronously the data signals received from the Extreme and transmitted by users on your LAN. Adding an AirPort Express will not increase the speed of your network, since it is limited by the speed of data transferred through the Extreme. However, you should find that you have full signal strength available for wireless devices throughout the house now, especially in areas where before signals were weak, intermittent, or non-existent. The price of an AirPort Express is inexpensive compared to the benefits it offers, and for Mac users, it could not be easier to set up and use. 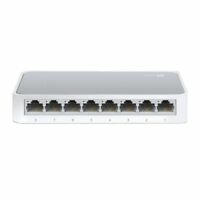 I strongly recommend this approach to extending the range and strength of your LAN. I messed with this thing for hours and it never worked as advertised. I needed it to extend my Airport Extreme's wifi range. It just kept messing up the coverage. Very frustrating. This was a remanufactured Apple wireless router that works perfectly and looks like new. I using it as an extender to my home network that is fed by an Airport Extreme Router. Apple is known for their easy interface to their routers and this Airport Express is no exception. I use the Express to provide a wired drop to a weather station bridge and to provide an extended network in the rear and outside my home. Unfortunately Apple has exited the marketing and production of the Airport Extreme and Express router. It's the best routers I have ever used and their simplicity and power are above reproach. I highly recommend this product although buy used or remanufactured equipment does carry some risk. When I selected the "Extend Existing WiFi Network" option to connect wirelessly to my generic WiFi router, the connection wasn't reliable. I also got a flashing yellow warning light. When I connected to the network via wired Ethernet, everything was fine. In an all-WiFi system the AirPort Express is very picky about what kind of WiFi router you're using. I suspect if I was using an AirPort router this wouldn't be an issue. If you can connect the AirPort Express via cable this isn't a concern.